HOPE Outdoor Gallery. Photo courtesy of Free Fun in Austin. 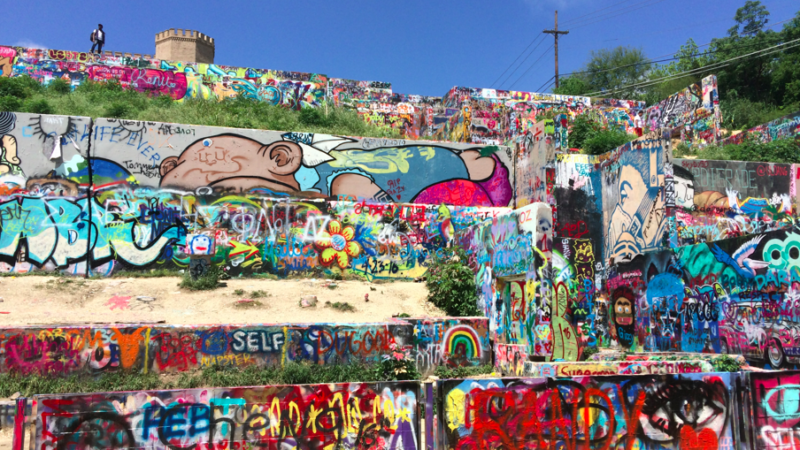 Austin, Texas is a wonderful city to visit with kids in tow. From theater under the stars to concerts in the park, there is always something happening in the Live Music Capital of the World. Check out our guide to the best free things to do in Austin before you plan your next vacation deep in the heart of Texas! Mural located at Annie Street & S. 1st Street in Austin. Photo courtesy of Free Fun in Austin. Austin, the capital of Texas, is home to more free fun than you could possibly conquer in a weekend, so you might want to plan to stay awhile. From barbecue and breakfast tacos to swimming holes and scenic views, there are endless choices for an incredible Austin visit that won’t break the bank! Here are just a few of the many adventures you can have in Austin, for free! 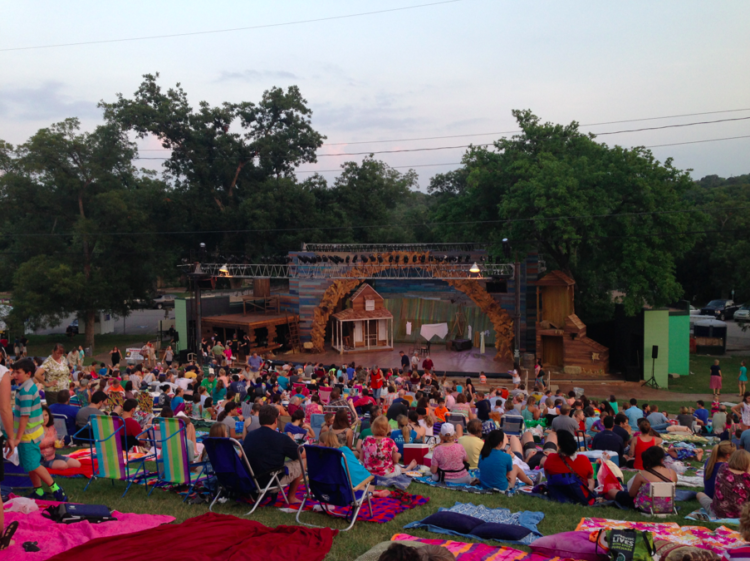 Zilker Summer Musical at Zilker Hillside Theater. Zilker Park has something for everyone. Dig for dinosaur bones at the free Austin Nature and Science Center, then stroll through UMLAUF Sculpture Garden and Museum (free during summer months). 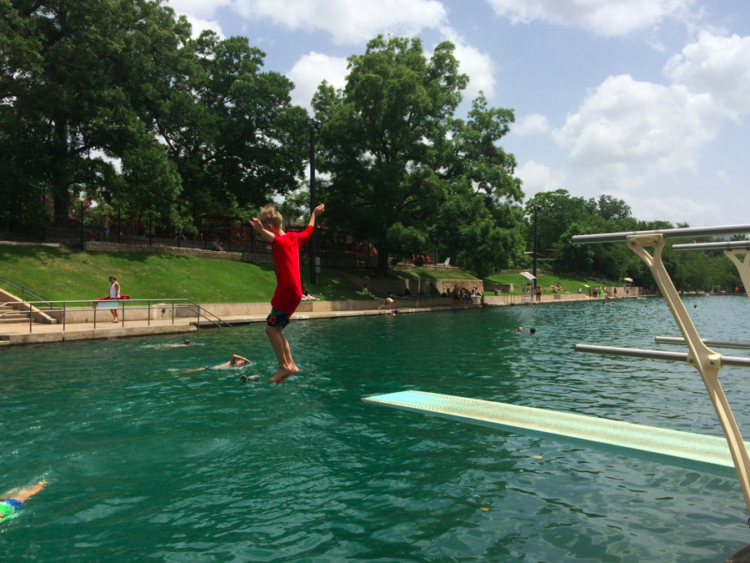 Cool off with a dip in Barton Springs Pool (free after 9 p.m.) and spend some time on the playground! In summer months, be sure to catch the incredible free live music series Blues on the Green, hosted by local radio station KGSR, and the annual Zilker Summer Musical on the Hillside. Peacocks, sculptures, and a beautiful view! Picnic with peafowl in Mayfield Park, then head to the neighboring property, The Contemporary Austin’s Laguna Gloria (free on Tuesdays), for gardens and outdoor art exhibitions. If little legs aren’t overtired, climb nearby Mt. Bonnell’s 106 steps for sweeping views of Austin from up on high. With local live music playing on the sprawling outdoor patio and a large playground just steps away, Central Market is an ideal spot to grab a casual family meal. Plus, kids eat free on Tuesday evenings, starting at 5 p.m.
Free Capitol tours are conducted daily beginning in the Capitol South Foyer and concluding in the Capitol Extension, and feature the Capitol, Texas history, and the Texas legislature. Guests can also take a self-guided tour of the Capitol building, Capitol grounds, and the Trail of Trees. Be sure to follow the sidewalk across the grounds to the Capitol Visitors Center, which has free interactive exhibits on the second floor. If you’re looking to spend a low-key morning downtown, head to the largest independent bookstore in Texas for storytime, then walk across the street to enjoy a picnic by the playground on the Whole Foods Market rooftop plaza! Stay up past dark to dance in downtown Butler Park’s Liz Carpenter Fountain. Or, for littles who need to get to bed early, check out another one of Austin’s many free splash pads. From April through September, folks gather on the Congress Avenue Bridge and surrounding areas to get a glimpse of the largest urban colony of Mexican free-tailed bats emerge nightly on their quest for food. Austin’s children’s museum encourages STEM (Science, Technology, Engineering and Math) learning, for babies on up. The fun-filled facility is an interactive science and technology center that will entertain for hours. Bring a spare outfit for your tot, who is bound to get wet splashing around in the indoor water exhibit, Currents. Admission is by donation (suggested $1) on Wednesdays from 4-8 p.m. Arrive early to play at the playground across the street, and visit with the ducks in nearby Mueller Lake! With more than 1.5 million visits a year, the 10-mile downtown hike-and-bike trail is Austin’s most recognized and popular recreational area. Open Saturdays from 9 a.m. to 1 p.m. year round, rain or shine, the Sustainable Food Center’s downtown farmers’ market at Republic Square Park (422 Guadalupe St) is the place to find farm fresh foods from local growers, as well as baked goods and arts and crafts from local artisans. The SFC Farmers’ Market is not only certified by the Texas Department of Agriculture, but also by the more rigorous Texas Certified Farmers Market Corporation. That’s a statewide professional agricultural trade organization that requires farmers’ markets to have 51% or more farmers at their markets. Limited free parking is available just south of the market and at City Hall, or at the State Parking Garage at 3rd and San Antonio. 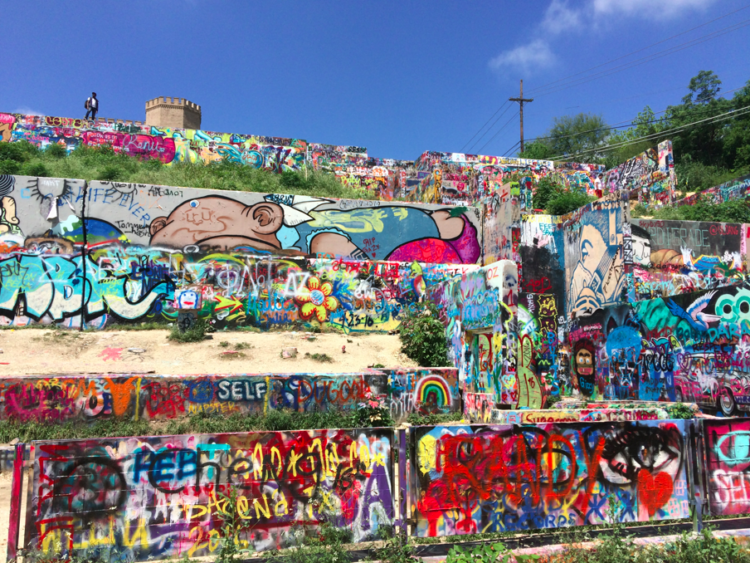 No visit to Austin is complete without a stop at this unique graffiti park. If you love what you see, head off on your very own mural scavenger hunt! 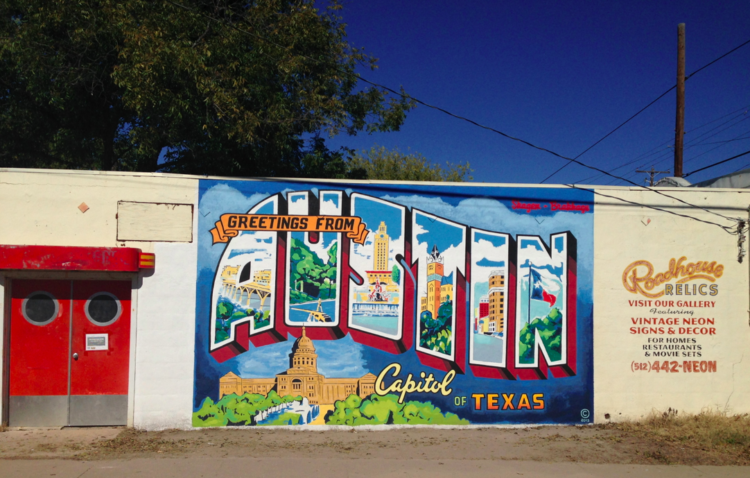 Austin boasts street art around nearly every corner. Follow Congress Avenue south of the Texas State Capitol to eat, and shop, and then eat some more! You will find quirky antiques, vintage clothing, locally owned restaurants, live music, candy shops, a cupcake trailer, cowboy boots, coffee shops, murals, and more. Bring your camera, and your appetite! When you’ve had your fill of culture and cuisine, head out into nature to see why locals love living in Austin. Follow a trail, cool off in a creek, and keep an eye out for Texas wildlife. Enjoy a stroll along the Barton Creek Greenbelt to Twin Falls or an urban hike in Wild Basin Wilderness Preserve. You can find great kid-friendly hike recommendations here. The free O. Henry Museum on 5th Street offers a look into the life of William Sidney Porter in the Austin years leading up to his controversial prison term, after which he assumed the pen name O. Henry and set about transforming himself into the famed short story writer. 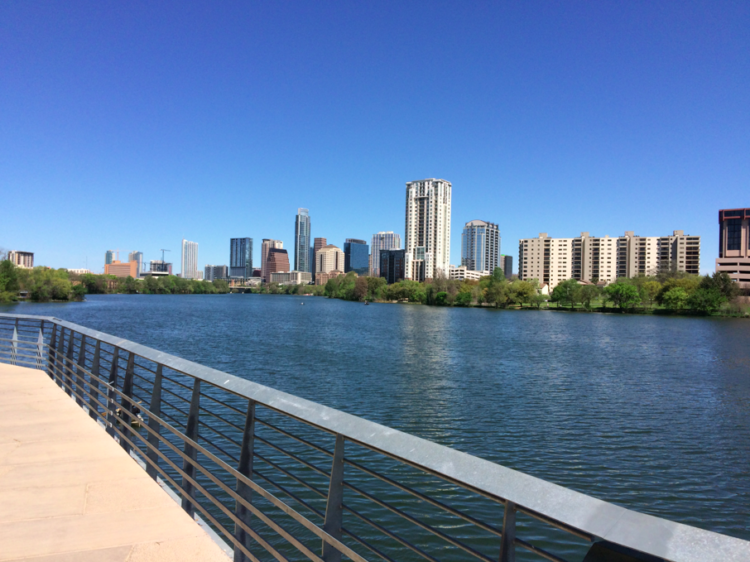 Austin’s brand new boardwalk, which completes the city’s Hike and Bike Trail, provides a scenic route for a stroll along Lady Bird Lake. Don’t forget your camera as the boardwalk offers picture-perfect views of the Austin skyline. View from the Austin Boardwalk. Photo courtesy of Free Fun in Austin. Take some time to meander through this historic hotel with its opulent architecture and elegant common areas. Built in 1886, and located in the heart of downtown, the Driskill has been restored to its original beauty and is quite a marvel to explore. Guests can also enjoy live music from local artists at the Driskill Bar most evenings, or stop for a treat at the Driskill’s 1886 Cafe & Bakery. 9th Street is an ongoing community cooperative work project where locals have worked to create hundreds of trails and dirt mounts in Duncan Park for BMX riding. Even if you don’t have a bike along, it’s fun to stop and watch the pros perform stunts. The People’s Gallery at Austin City Hall showcases the talents of local artists with an extensive annual art exhibition in the atrium and open areas of the first three floors. Approximately 150 contemporary artworks are on display, including paintings, photographs, sculptures and more. You may view the exhibit for free anytime the building is open. Pick up the People’s Gallery brochure in the atrium or second floor lobby for a self-guided tour and information about each artwork and artist. Since its founding in 1984, Mexic-Arte Museum has been designated as the Official Mexican and Mexican American Fine Art Museum of Texas by the 78th Legislature of the State of Texas. The Museum is free on Sundays. Check out the Harry Ransom Center on the University of Texas at Austin campus for current and permanent exhibitions, including the Gutenberg Bible (the first substantial book printed from movable type on a printing press), the First Photograph (an 8 x 6.5-inch heliograph produced by Joseph Nicéphore Niépce in France), and more. Admission is always free. Take a dip in natural water! There are swimming areas with waterfalls, diving boards, rope swings, spring-fed pools and more. You can see a list of local favorites here. Barton Springs in Zilker Park. Photo courtesy of Free Fun in Austin. If you’re visiting during the summer, take in a free Austin Symphony ensemble concert, Sunday evenings at 7:30 p.m. on the Long Center lawn. See tanks, planes, and a piece of the Berlin Wall at the free Texas Military Forces Museum in Camp Mabry. Admission to both the base and the museum are free. Austin is the Live Music Capital of the World, so don’t leave town without seeing a show. Guero’s hosts free Texas Radio Live broadcasts in their Oak Garden on South Congress, Wednesday evenings from 6 to 8 p.m.
Want more? 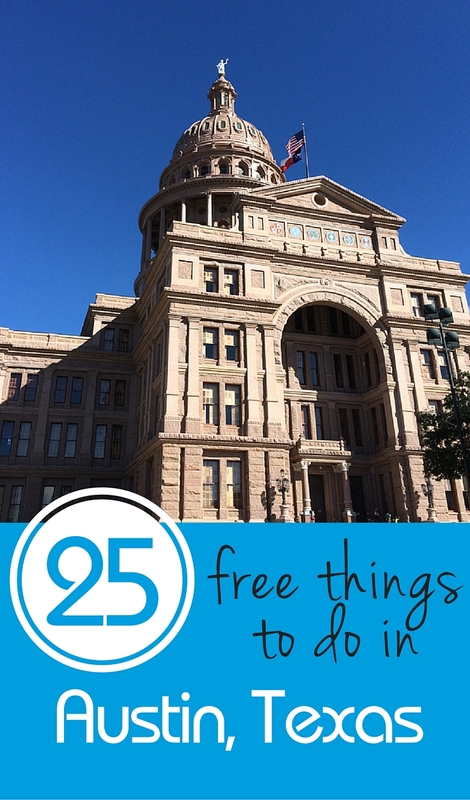 Check out this checklist of 100+ things to do in Austin for free! And if you’ve got a few bucks to spend, check out these 7 fun things to do in Austin with kids. If you visit at Christmastime, don’t miss the fabulous Texas Trail of Lights holiday lights display. 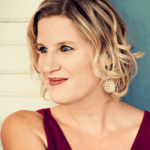 9 Fun Things to Do in Austin - BBQ, Music and More! 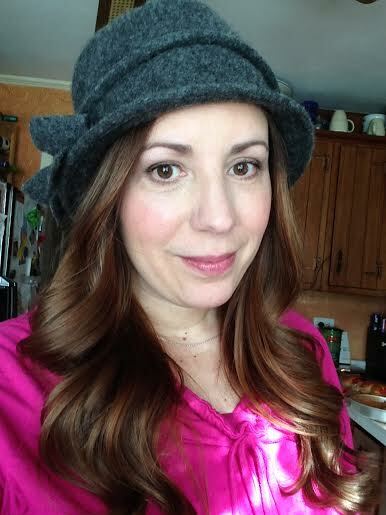 When not running around on adventures with her five children, Heidi Gollub volunteers for the Austin Convention and Visitors Bureau and creates content for the local news. 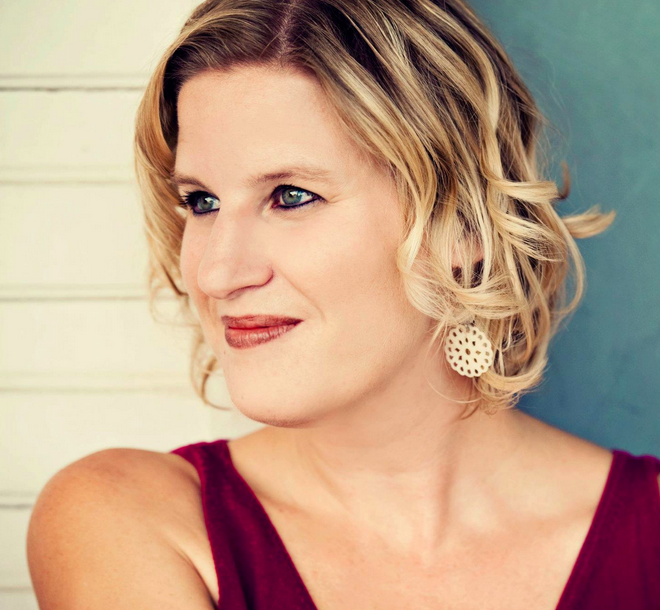 She frequently appears on television and was recently a speaker at Mom 2.0 and the Texas Conference for Women. Wow! So much to see and do on a small dime. I see a visit in the VERY near future! Looking forward to visiting the Texas Military Forces Museum! Thanks for the recommendation!